It’s the year 2044, and the real world has become an ugly place. We’re out of oil. We’ve wrecked the climate. Famine, poverty, and disease are widespread. Like most of humanity, Wade Watts escapes this depressing reality by spending his waking hours jacked into the OASIS, a sprawling virtual utopia where you can be anything you want to be, where you can live and play and fall in love on any of ten thousand planets. And like most of humanity, Wade is obsessed by the ultimate lottery ticket that lies concealed within this alternate reality: OASIS founder James Halliday, who dies with no heir, has promised that control of the OASIS – and his massive fortune – will go to the person who can solve the riddles he has left scattered throughout his creation. Is It a Story? Is It a Book? No, It’s a Film!, 12 Young Adult Movie Adaptations We Cannot Wait to See This Year! Ernest Christy Cline (born March 29, 1972) is an American novelist, spoken-word artist, and screenwriter. 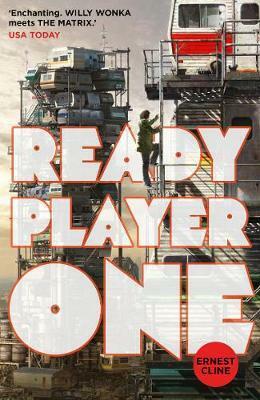 He is mostly famous for his novels Ready Player One and Armada; he also co-wrote the screenplay of Ready Player One's upcoming film adaptation by Steven Spielberg.